"I have recently launched my social media agency, Van Street Media, and I am looking for young creatives to interview on the blog. Please email with a little information about what it is that you do". We've included a Donate button for those that would like to see this Deep House effort go further. With 70 - 80 posts per day & double that amount of group add requests, we need internet access to keep functioning. 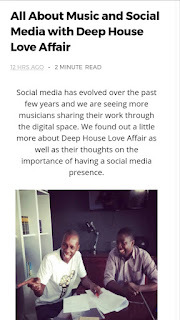 © Deep House Love Affair!!. Design by FCD.